The shooting of Vijay 61 kick-started last week and apparently scenes featuring the 80’s period Madurai portion from the film are currently being shot in the outskirts of Chennai. A shooting spot still of Vijay was leaked recently. The actor was seen with a ‘veshti’ sporting a thick beard. 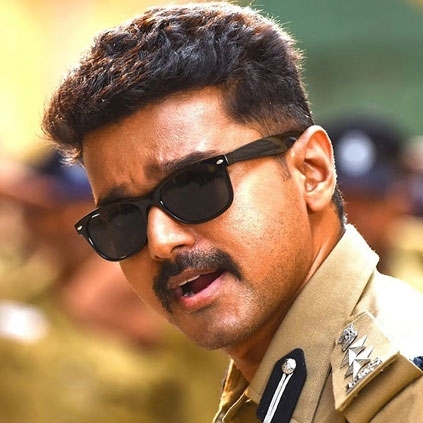 We are not sure if Vijay will be playing a dual role or even a triple role in the film, but now we hear that one character that Vijay plays would be a police officer. We are yet to get an official confirmation regarding this from the team. But if it’s true, this would be Vijay’s 4th cop avatar. He had previously played a police officer in films like Pokkiri, Jilla and Theri. More updates regarding Vijay 61 to follow soon. Extra Show Added For Thuppakki Due To Excessive Demand From Vijay Fans!